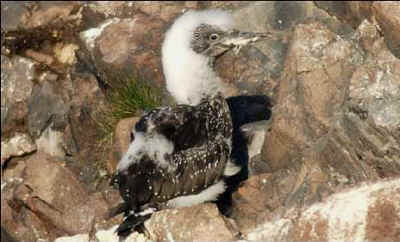 The men catch 2000 "guga" or gannet chicks - the gannet chicks that are almost fully grown. They return two weeks later with the 2000 guga - which they have caught, killed, pickled and salted. There is a lot of skill and the art of hunting and bring back the guga is a real art - traditions that have been passed on through the generations for centuries. The gugas are killed using a long pole with a spring loaded jaw on top. The guga is snatched from its nest and passed straight on to another man who strikes it dead with a single blow from a rock. The bird is then passed to another gentleman - who will remove the birds head taking care to leave its long neck. The entire process is actually made as quick and painless as possible. We at Scotland for Animals don't see any difference between eating gannet or eating chickens, pigs, cows, etc. Both are equally objectionable. What we do object to is the implication that it is somehow an honourable tradition - to hunt animals and kill them with rocks. The hunters have contacted us claiming that we're interfering with local custom. The suggestion that Scotland or its people somehow support this kind of backwards nonsense is not true. We're increasingly seeing animal abusers demanding, and usually getting, carte blanche to carry out serious cruelty by playing the culture card. From halal/ kosher meat to bullfighting to Gannett hunting it's all the same... groups of people trying to drag society backwards in the name of tradition. It's a deeply cynical ploy to get away with murder and, sadly, it's paying dividends for those involved. The Scottish National Party has been circulating an official public response to Scotland for Animals' reports that SNP MP Angus MacNeil participated in this year's hunting of Gannet chicks. The Party of Government in Scotland have claimed damages by claiming: "Please firstly note that Angus MacNeil MP did not take part in the actual hunting of gannet." This is spin and not very clever spin at that. The MP gushed: "(I) feel very fortunate to be a small part of this year's expedition.” Appears he did not batter any chicks to death personally but chose instead to join and egg on the ones who did. We really don't know which is worse. To suggest he didn't take part is as ludicrous as claiming those who ride out with the fox hunts or beat the grouse for the shooters aren't taking part in the hunting and killing of these animals. The Scottish National Party also justify their support of the stoning to death of baby gannets by stating "Recent studies have shown an increase in the population of gannet over the past 30 years." We hope the Party don't twig that the stray dog population's been rising too!